When people think of Hitchcock's music, Bernard Herrmann usually comes first to mind. But of his 53 films, old Benny only worked on eight. One might think of Franz Waxman too, but he worked on a measly four. 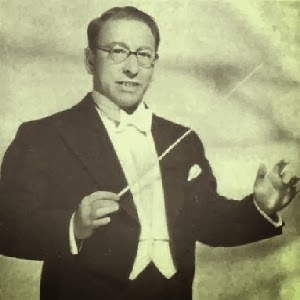 The title of "Hitchcock's Most-Used Composer or Conductor" actually goes to Louis Levy (1894-1957). Yep, if you're a Hitchcock geek, you should be familiar with Levy. As should I—but really, I'm not. Little is known about him, other than that by age 16 he was arranging music and performing for silent films and that (according to Wikipedia) he's been credited with first developing the "theme song" in silent movies. He worked on a total of 29 films and was also active in radio. None of Hitch's biographers even mention the man. And that's strange, considering that he worked on the string of spy movies that established Hitch as England's cinematic wunderkind. In Hitchcock's Music, Jack Sullivan observes that, under Sullivan's baton, Hitch's movies had "a more British musical language, with firmer harmonies" that suggested Edward Elgar. When the director moved to Hollywood, they parted company for eleven years. There, under Selznick's thumb and under the sway of other producers, he apparently had little say in the matter of music. But when Hitch struck out on his own and could choose his own personnel, he went right back to Levy, hiring him to conduct Richard Addinsell's operatic score for Under Capricorn—and that says more about their relationship than anything I can find in print. As I understand Joel, this scene was one Mr. Hitchcock regretted filming later on in his interviews with Francois Truffaut because he felt the audience didn't want to see the young brother killed. It is a small masterpiece in itself and the music is very good. Thanks for reminding me of the importance of Mr. Levy's music in Hitchcock's 1930's British films--something I had not appreciated. Good point Joel. In terms of suspense the sequence in "Sabatoge" is more drawn out of course and that may have led to more negative reaction from the audience, especially in the 1930's. On the other hand, Hitchcock was a genius so why shouldn't he feel free to break the rules later on , even his own. Happy Thanksgiving! Happy Thanksgiving to you, too, Doug!